An exhilirating 1 hour Jet Ski tour from Puerto de Los Gigantes passing through Masca and Barranco Seco (includes boat navigation). 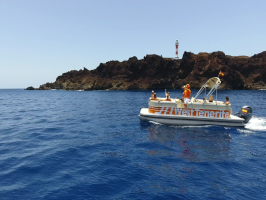 The most complete excursion, departing from Puerto de Los Gigantes, the adventure lasts 2 hours and gives you access to various activities in which you can discover the most virgin and wild area of ​​Tenerife, The Cliffs of the Giants. - Jet Ski for two people for 1 hour. - Swimming and snorkeling with the most powerful torpedo on the market or take a rest enjoying a fruit snack for 30 minutes. For each Jet Ski, you will be given a waterproof bag which will contain a GO-PRO camera and accessories, a flexible stick, and can also hold personal effects that you wish to take with you on the trip. As well as being able to shoot your own videos and photos from the GOPRO Hero 5, there is also an additional Professional photoshoot available. If you wish to take home the GO-PRO snaps and 100 professional photos this is payable locally. - Duration according to the chosen activity, for Premium West: 2 hours or if it is for Jet Ski: 1 Hour. Please ensure you arrive at the meeting point at least 30 minutes prior to the tour start time. Extra Comments : Please bring swimsuit and sun cream.